What Day Of The Week Was March 19? 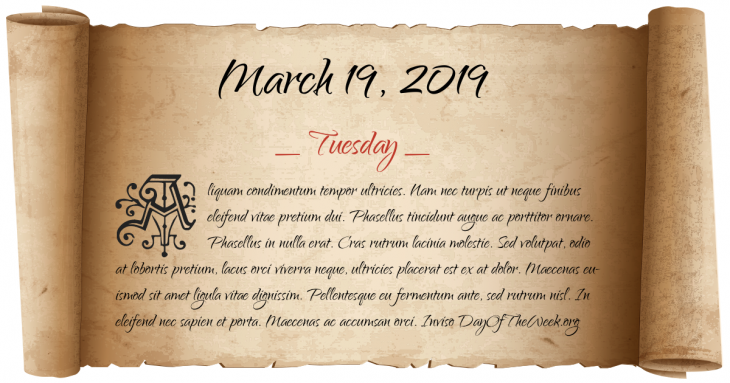 March 19, 2019 was the 78th day of the year 2019 in the Gregorian calendar. There were 287 days remaining until the end of the year. The day of the week was Tuesday. It’s uncommon for the March equinox to fall on this day. The last time it did was in 1796 and the next will be in 2044. The Taiping reform movement occupies and makes Nanjing its capital until 1864. American Civil War: The Battle of Bentonville begins. By the end of the battle two days later, Confederate forces had retreated from Four Oaks, North Carolina. World War II: Nazi forces occupy Hungary. Algerian War of Independence: A ceasefire takes effect. The wreck of the SS Georgiana, valued at over $50,000,000 and said to have been the most powerful Confederate cruiser, is discovered by then teenage diver and pioneer underwater archaeologist E. Lee Spence, exactly 102 years after its destruction. Texas Western becomes the first college basketball team to win the Final Four with an all-black starting lineup. The 385 m tall TV-mast at Emley Moor, United Kingdom, collapses due to ice build-up. Konginkangas bus disaster: A semi-trailer truck and a bus crash head-on in Äänekoski, Finland. 24 people are killed and 13 injured. Who were born on March 19?